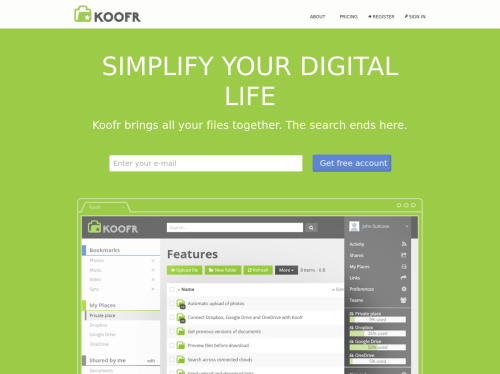 Koofr: Simplify your digital life. Koofr brings all your files together. Connect your Dropbox, OneDrive, Google Drive, PC, Macbook, iPhone, Android, server and much more into one application and have all your files available at any moment. The search ends here. Don't waste your time managing and searching for your files, make them work for you. Simplify how you store, access and share your photos, videos and documents.